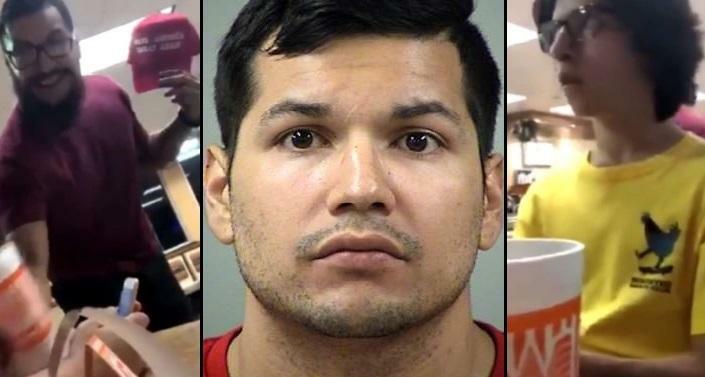 The man seen in a viral video bullying a group of teens eating at a San Antonio restaurant was originally arrested but charges were not filed by police. 16-year-old Hunter Richard was eating with friends when a large man came up and took his "Make America Great Again" hat right off his head and then threw a drink in his face. Now, a grand jury has indicted 30-year-old Kino Jimenez on a felony count of theft of a person. Jimenez made headlines after he bullied the teens and stole a MAGA hat from them all on video. Jimenez even posted a video about his upcoming court date and the fact he could be facing two years in prison. Also, if he is such a great mascot and a hero for the left for standing up against those racist teens wearing MAGA hats, then why does he say the word n*gger in every sentence in the video below? This is the type of person the left praises and holds out as an example worthy of recognition when in reality Jimenez is nothing but a low-life bully. Luckily, the boys he assaulted by snatching their MAGA hat then throwing a drink on their face were recording and now the culprit has been publicly shamed with the clip of the incident garnering a whopping 11.6 million views on Twitter alone. Bexar County court records reveal Jimenez was indicted Wednesday on a charge of theft of a person which is a felony punishable by up to two years in prison. Other social media users, who were white unlike the teens who the media accused of being racists, had some choice words for Jimenez. It is nice to see some people stand up for the bullying and the harassment of people just for wanting to make America great again and supporting our current president. Assault of Minor(s) by an Adult is no laughing matter. Violation of Civil Rights is no Laughing matter. What is a serious Laughing Matter is how this Liberal Hateful TDS Act will cost him big time. What is great, is now a Legal Precedent will be set and under US common law can be cited to police and DA's, when demanding arrest of Liberals for their violent TDS acts. ATTN foolish white people! do not mix your genes with non-whites because the colored savage genes are dominant. you know I'm glad this skank POS is going to prison… he should be made to pay victim cash allotment as well for mental and physical assault. that said let me just say this… comment about mixing genes is stupid!!! whites are at the top of the list for being serial killers… there are good people in all races and bad people in all races… skin aint got jack to do with it!! !